Like most of the Middle East, the territory of Israel was part of the Ottoman (Turkish) Empire for four centuries until World War I. The area was occupied by British troops in 1917 and after the end of World War I it became part of the British Mandate of Palestine. The state of Israel proclaimed its independence in 1948 when British forces were withdrawn. Israel has a coastline about 150 km (90 mi) long facing west on the Mediterranean Sea. In addition, at its southern tip the country has a very short coastline on the Gulf of Aqaba, an arm of the Red Sea. The most important ports are Haifa and Ashdod on the Mediterranean and Eilat on the Gulf of Aqaba. Lighthouses in the country are operated by the Administration of Shipping and Ports, an agency of the Ministry of Transport and Road Safety. 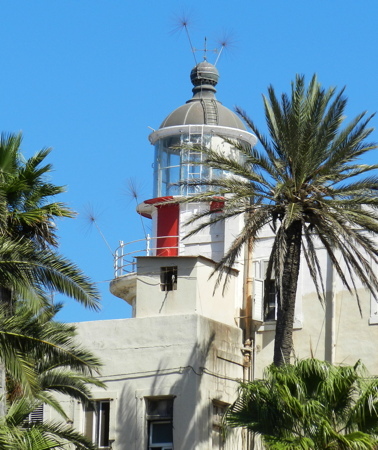 There are historic light stations at Yafo (Jaffa), Tel Aviv, Har Karmel (Mount Carmel) and Akko (Acre). More information about them would certainly be welcome. Hebrew is the official language of Israel. The Hebrew word for a lighthouse is מגדלור (mig'dalor). ARLHS numbers are from the ARLHS World List of Lights. Admiralty numbers are from volume N of the Admiralty List of Lights & Fog Signals for the Mediterranean Sea. Lights of the Gulf of Aqaba were formerly included in volume E of the Admiralty List of Lights & Fog Signals but in 2013 they were moved to volume D with new numbers. U.S. NGA List numbers are from Publication 113 for the Mediterranean Sea and 112 for the Gulf of Aqaba. Introduction and index to Wikipedia's articles on the lighthouses. Danny Dorfman's outstanding collection of photos on Flickr.com. This Hebrew-language article in Sailing News has the historical information also found in Wikipedia's articles. Navigational chart information for Israel. Date unknown. Active; focal plane 64 m (210 ft); white flash every 10 s. Approx. 9 m (30 ft) round 5-legged (pentapod) tower with lantern and gallery, rising from a round 1-story equipment shelter. Lighthouse painted white with black trim and a black band around each of the legs. Dorfman's photo is at right, Wikimedia has several distant views, and Google has an indistinct satellite view and a distant street view. Located atop a steep bluff on the west side of the Gulf of Aqaba about 1.2 km (3/4 mi) northeast of the Egyptian border and 7 km (4.5 mi) southwest of the port of Eilat. Site open, tower closed. ARLHS ISR-002; Admiralty D7297.9 (ex-E6042); NGA 112-30436. 1966. Active; focal plane at least 65 m (215 ft); two white flashes every 10 s. Light mounted on one of the two smokestacks of the Rutenberg Power Station, probably on the north stack. Carmel Horowitz has an aerial photo of the two stacks, Wikimedia has a photo and Google has a satellite view. Ashkelon, in southwestern Israel, is a city of about 140,000 residents. The site of this large power plant and a desalinization plant, it is also the Mediterranean terminal of the Trans-Israel oil pipeline. Located on the waterfront at Ashkelon. Site and tower closed. Admiralty N5970; NGA 113-21272. Date unknown. Active; focal plane unknown; two green flashes every 6 s. Approx. 18 m (56 ft) multistage unpainted concrete tower. No photo available but Bing has an indistinct satellite view. Located at the end of the main breakwater at Ashkelon. Site and tower closed. Admiralty N5971; NGA 113-21272.2. Date unknown. Active; focal plane unknown; two green flashes every 5 s. Approx. 18 m (56 ft) multistage white tower mounted on a 2-story round concrete base. Wikimedia has several photos, Lightphotos.net has a photo, and Google has a street view and an indistinct satellite view. Located at the end of the main breakwater of the Ashkelon Marina. Accessible by walking the pier. Site open, tower closed. Admiralty N5970.5; NGA 113-21272.1. 1966. Active; focal plane 76 m (249 ft); three white flashes every 20 s. 42 m (138 ft) cylindrical concrete tower carrying an array of communications gear as well as a lantern. 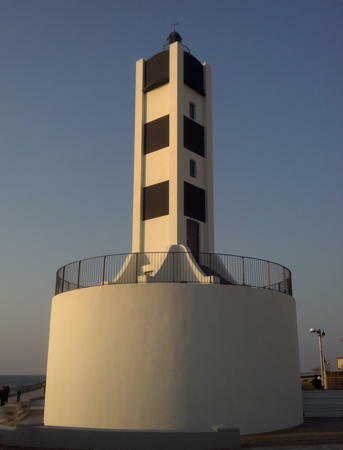 The upper half of the lighthouse is round and is painted in a red and white checkerboard pattern; the lower half is triangular and is unpainted gray concrete. The lantern and lens were transferred from the Yafo (Jaffa) Light (next entry). A photo is at right, Dorfman has three good photos, Wikimedia has a portfolio of photos, and Google has a street view and a fuzzy satellite view. Founded in 1956, Ashdod has a large modern harbor and has become Israel's largest port. The city has a population of about 225,000. Located on Yona Hill on the south side the harbor of Ashdod. Site and tower closed, but the lighthouse can be seen from many points in the area. ARLHS ISR-001; Admiralty N5967; NGA 113-21260. Date unknown. Active; focal plane unknown; two quick red flashes every 2 s. Approx. 20 m (66 ft) skeletal tower painted with red and white horizontal bands. The light is at the center of an aerial view of the harbor by Carmel Horowitz, and Bing has a satellite view. Located on an inner breakwater of the Ashdod port. Site and tower closed. Admiralty N5969; NGA 113-21268. Date unknown. Active; focal plane about 10 m (33 ft); green flash every 4 s. 6 m (20 ft) post. A small equipment cabinet stands next to the light. Sergej Kostjucenko has a street view but the light is not seen in Google's fuzzy satellite view. Located at the end of the breakwater of Yafo's harbor. Accessible only by boat (the pier is not walkable). Site open, tower closed. Admiralty N5963; NGA 113-21256. 1936 (station established 1862). Apparently reactivated; focal plane unknown; continuous red light. Approx. 10 m (33 ft) round cylindrical concrete tower with lantern, gallery, and four ribs. Lighthouse painted with red and white horizontal bands. 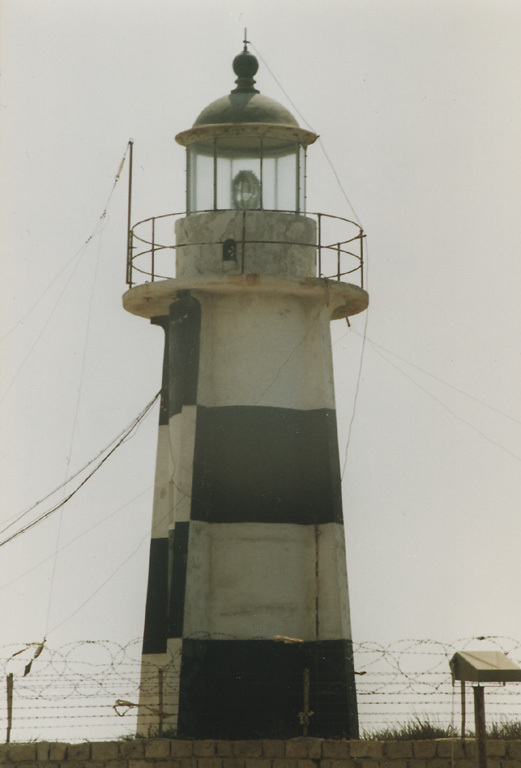 The original lantern and lens were transferred to the Ashdod lighthouse in 1966. Remi Jouan's photo is at right, Dorfman has several photos, Yehuda Cohen also has a good closeup photo, Wikimedia has a nice view of the lighthouse in context, David Gurevich has an evening street view from the breakwater, and Google has a street view but only a fuzzy satellite view of the neighborhood. 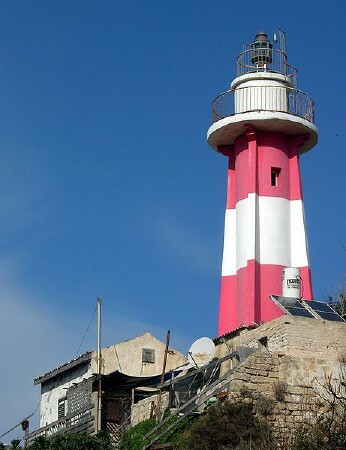 The general-purpose Jaffa Light was deactivated in 1966 but the tower continued to be well maintained as a daybeacon. The fresh paint and solar panels seen in recent photos make it appear very likely that the light has been reactivated, apparently as the rear light of an approach range. Findlay's 1879 light list gives 1862 as the date of the first lighthouse. Huelse has a historic postcard view of the 1875 Jaffa lighthouse, which was built by French engineers for the Ottoman Empire. Jaffa (now called Yafo) is the historic port associated with Jerusalem. The ancient city is now a district within the much larger modern city of Tel Aviv, and in 1966 port operations were relocated to Ashdod. The old harbor now serves only small craft. Located on the historic Jaffa waterfront. Site open, tower closed. ARLHS ISR-005; Admiralty N5962.5; NGA 113-21258. Date unknown. Active; focal plane 10 m (33 ft); five green flashes every 20 s. 7 m (23 ft) round strongly conical concrete tower, painted green with two white horizontal bands. Wikimedia has numerous photos and David Ichenhausen has a street view but Google has only a fuzzy satellite view. NGA lists a "red pole, white bands." Located at the end of the main breakwater of the marina. Accessible by walking the pier. Site open, tower closed. Admiralty N5959.4; NGA 113-21252. 1935. Inactive since 1965 (a decorative light may be displayed). Approx. 17 m (56 ft) square cylindrical concrete tower with a small lantern, mounted on a round stone foundation. Lighthouse painted white with four black panels mounted or painted on each face. Wikimedia has an excellent 2013 photo (also seen at right), Nadav Barkai has a 2016 photo, and Google has a 2015 street view and an indistinct satellite view. Built by British authorities, this lighthouse stands on the north side of the entrance to the HaYarkon (Yarkon) River in the area of Tel Kudadi, a stronghold from the Biblical period of Israel's history. The modern harbor of the Reading Power Plant is just to the north. The lighthouse was apparently restored sometime in 2011-12, and it may have been reactivated, although it has not been added to international light lists. The black panels on the tower recall the historic black and white checkerboard daymark pattern. The boardwalk seen in the recent photos was built in 2007 as part of a larger project to clean up the river and make it accessible to the public; it is also a part of the Israel National Trail. Located on the beach near the foot of the Tel Aviv South Breakwater. Site open, tower closed. ex-Admiralty E5958. Date unknown. Active; focal plane 15 m (49 ft); green flash every 5 s. 11 m (36 ft) white concrete post with gallery. Wikimedia has David Shay's photo, and Google has a street view and an indistinct satellite view. Located at the end of the main breakwater of the marina at Herzliya, north of Yafo. Accessible by walking the pier. Site open, tower closed. Admiralty N5957; NGA 113-21238. Date unknown (1960s?). Active; focal plane 14 m (46 ft); two flashes, one white and one red, every 15 s. Light mounted on the roof of a 1-story concrete building supported by concrete piles. The building is painted dark blue with white trim. The building is part of the Mevo'ot Yam Nautical School. Dorfman has a closeup photo, Menachem Arslan has a street view, and Google has an indistinct satellite view. Located on the north side of the harbor in Mikhmoret, about 7 km (4.5 mi) north of Netanya. ARLHS ISR-006; Admiralty N5956; NGA 113-21236. Note: Haifa is Israel's third largest city and most important port. The port area is on the southeastern side of Haifa Bay, the only naturally protected harbor on the Israeli coast. 1928 (station established 1864). Active; focal plane 179 m (587 ft); white flash every 5 s. 20 m (66 ft) octagonal cylindrical tower with lantern and gallery rising from the seaward end of a 3-story building. The building is painted a light buff color; the lantern is painted with red and white vertical stripes, but the dome is black. This powerful light has a range of 55 km (35 mi). Dorfman's photo is at right, Trabas has a photo, Wikimedia has numerous photos, Dorfman has a photo, and Google has an indistinct satellite view and a very distant street view. 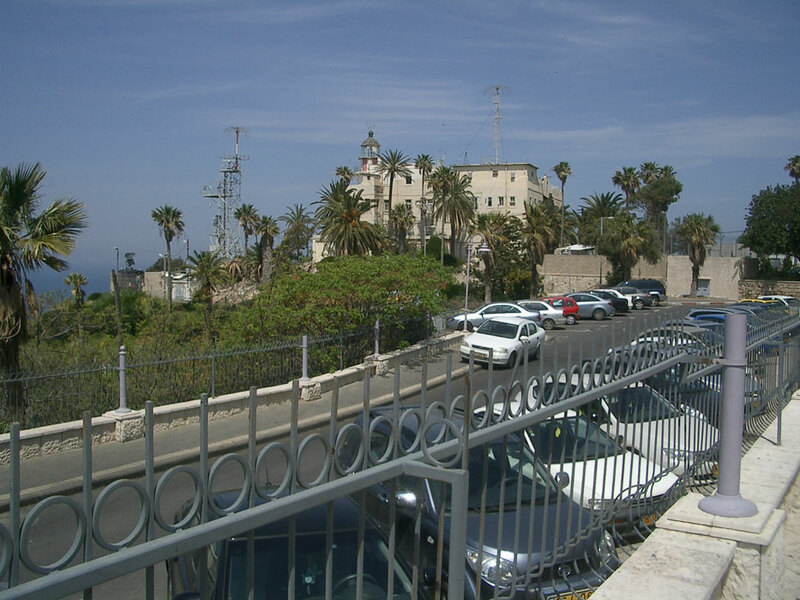 Mount Carmel is one of the most prominent landmarks along the Israeli coast, rising southeast of the seaport of Haifa. The lighthouse is often called the Stella Maris lighthouse because it is near the Carmelite Monastery of Stella Maris (Star of the Sea). Arne Berge has a view of the lighthouse and the monastery. 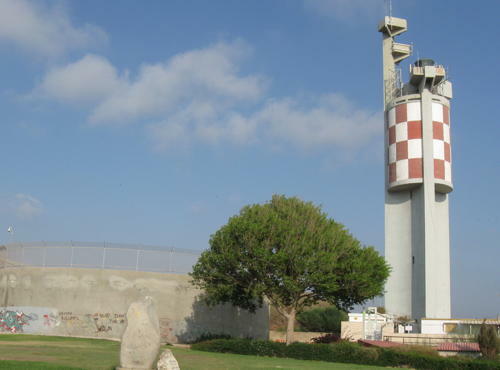 The lighthouse building is in use by the Israeli military and is closed to the public. 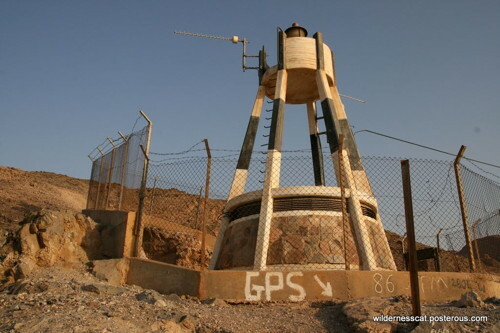 The earlier history of this light station is complex, and there is evidence of lights at several locations on the mountain at different times. Huelse has a postcard view of the 1864 lighthouse. The Fresnel lens of the lighthouse is on display at the National Maritime Museum in Haifa. Located on the seaward face of Har (Mount) Carmel about 1.5 km (1 mi) east of Haifa. Site and tower closed, but the building can be viewed from nearby. ARLHS ISR-004; Admiralty N5945; NGA 113-21212. Date unknown. Active; focal plane 11 m (36 ft); three white flashes every 10 s. Light mounted on a post atop a tapered square white concrete tower. The light is left of center in a photo of the breakwater, but Bing has only an indistinct satellite view. This light was formerly at the end of the main breakwater of Haifa harbor, but the breakwater has been extended (a post light marks its new end). Site status unknown. Admiralty N5946.05; NGA 113-21217. Date unknown. Active; focal plane 11 m (36 ft); white light, 2.5 s on, 2.5 s off. Light mounted atop a tapered square white concrete tower. The light is in the distance in a photo of the breakwater, Alexander Shalit has a very distant street view across the harbor, and Bing has a satellite view. Located in a curve (not really an elbow) of the main breakwater of Haifa harbor. Site status unknown. Admiralty N5946.1; NGA 113-21218. 2007(?). Active; focal plane unknown; red flash every 3 s. Approx. 25 m (82 ft) triangular skeletal radar tower standing atop a 2-story concrete harbor control building. Jeremy Sham has a sunrise view, Alexander Shalit has a very distant street view across the harbor, and Google has a satellite view. 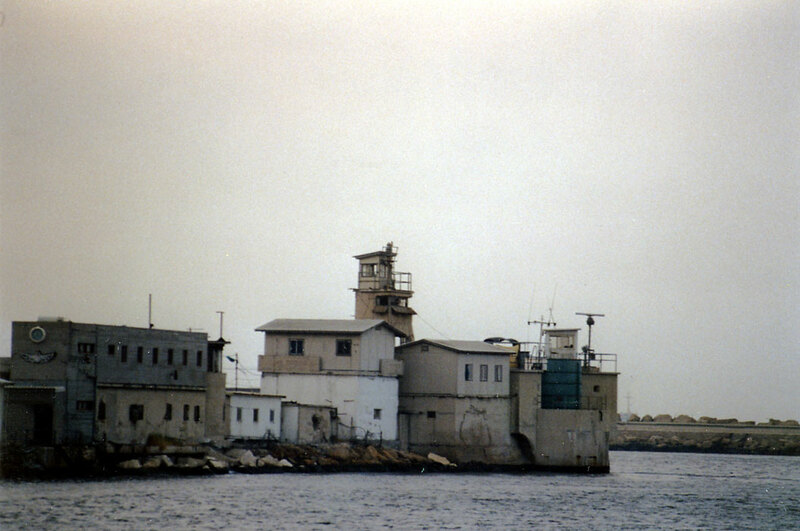 Trabas has a photo showing much older buildings, including a square concrete harbor control tower that formerly carried the light. The lee breakwater has been completely redeveloped as a containership terminal. Located at the end of the quay serving as the inner breakwater of Haifa harbor. Site status unknown. Admiralty N5947; NGA 113-21220. 1912 (station established 1864). Active; focal plane 16 m (52 ft); two white flashes every 7 s. 10 m (33 ft) round cylindrical concrete tower with lantern, gallery, and four ribs. Lighthouse painted in a black and white checkerboard pattern; lantern dome is gray metallic. A small 1-story equipment building, painted white, stands next to the tower. A photo is at the top of this page, Dorfman has a good 2009 photo, Trabas has a closeup photo, Wikimedia has numerous photos, Q.T. Luong has a photo of the seawall and light station, and Google has a street view and a satellite view. 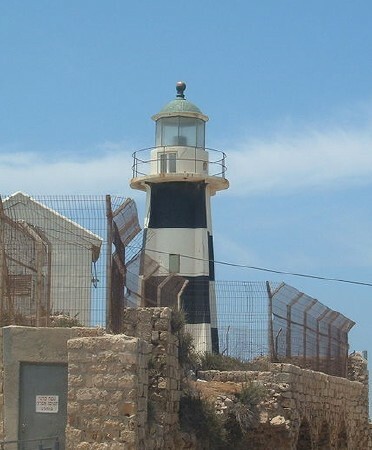 This is the only Israeli lighthouse surviving from the Ottoman era. The lighthouse is built atop the city's ancient walls on the site of an Ottoman watch tower. The ancient city of Acre, now called Akko, is built at the north entrance to the Haifa Bay, on a hook-shaped peninsula that shelters a small harbor. The lighthouse is located on the seaward face of the peninsula. Site open (the lighthouse is fenced but can be viewed from outside the fence.) Tower closed. ARLHS ISR-003; Admiralty N5944; NGA 113-21204. Caesarea Maritima. Although Wikimedia has filed this photo under Lighthouses, it is clearly a minaret. Caesarea became the capital of Roman Judaea in 70 CE and continued as the capital of the region through the Byzantine and early Moslem periods. The ruins of the city are preserved as an Israeli national park. The city's harbor was protected by two breakwaters, and there was a lighthouse at the end of the south breakwater. Divers have found what is believed to be ruins of this lighthouse underwater. Jaffa Prison. This tower on the old Jaffa Prison is sometimes described as a lighthouse, although it must have been used originally as a minaret. At night, it shows a green light from neon tubes. It is doubtful that this light has any navigational value (and being on the port side of the harbor entrance it would be red if it were an official light). Posted June 4, 2007. Checked and revised March 8, 2019. Lighthouses: 15. Site copyright 2019 Russ Rowlett and the University of North Carolina at Chapel Hill.